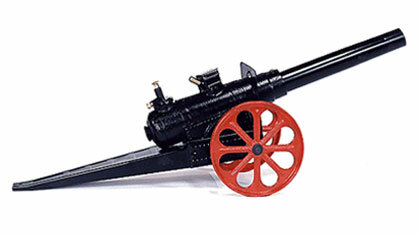 Image Below Or Add To Cart GAS FIRING CANNON: This is our best seller. It is designed similar to the cannon used by the Continental Army in the Revolutionary War. Features automatic charger mechanism for rapid, multiple firing. Made of cast iron and sheet metal, from the original 1935 tooling. 25" Long X 7" Wide X 7" High, Weighs 6 lbs.